Enormous Stratolaunch First Flight…But Is It Really The Biggest Plane Ever, As Many Are Reporting? With its 385-foot wingspan, 12 main landing gear wheels (plus two nose gear wheels), and 550,000-pound payload, the Stratolaunch took to the air on April 13 for the first time in preparation for its eventual mission: launching satellites into low-Earth orbit. News outlets are billing it as the "world's largest plane." Now, that's debatable. There's no question that the six-engined behemoth is in the mix, it does have the largest wingspan of any plane ever, and its payload is gargantuan; however, there are a few factors to consider when it comes to deciding the world's largest plane. The Stratolauncher entered the debate Saturday morning during its initial test flight. The aircraft took off from the Mojave Desert and flew for 2.5 hours at altitudes up to 17,000 feet. Designed by Stratolaunch Systems, the company founded in 2011 by late Microsoft co-founder Paul Allen, the plane will be used as a mobile launch platform for launching satellites from 35,000 feet. Once fully tested and approved, the jet is designed to ferry a rocket carrying a satellite to that altitude, launch it, and then land while the rocket climbs to 300 to 1,200 miles above Earth. 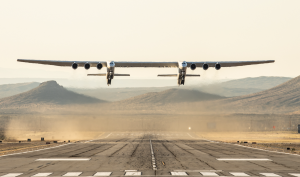 The idea, says Stratolaunch Systems, is to provide an economic alternative to traditional rocket launches. But is it the world's largest plane? Plane & Pilot explored that question in a recent Mysteries of Flight and found that one aircraft has the Stratolauncher beat in some categories. Read more here.